Translating a website isn’t an easy task, especially if you have limited internal resources, a complex site structure, or multiple languages to deal with. Usually, the process requires manual work and coordination, for example managing translators or keeping track of texts in various languages. This is where myGengo, which we recently described as “Mechanical Turk for translations”, comes in. The Tokyo-based startup today rolled out an API that allows developers to plug on-demand human translation directly into websites, apps, widgets, social networks, etc. The main idea is to automate the process for dynamic content as much as possible, without forgoing the power of human translation. Take an e-commerce site, for example, that keeps adding items to the database on a regular basis. That site could make use of the API by sending new item descriptions for translation to myGengo automatically from within the site. The startups’s team of now 800 pre-tested translators worldwide would then translate the item descriptions into any of up to eight different languages. The texts would then be inserted back into the e-commerce site automatically (“within hours”, as myGengo promises). myGengo also pitches its API as a way to monetize the user base of international social networks or community-driven sites. Owners of a document hosting platform, for example, could re-sell translations to users who might be interested in publishing their texts or presentations in multiple languages, earning a mark-up. 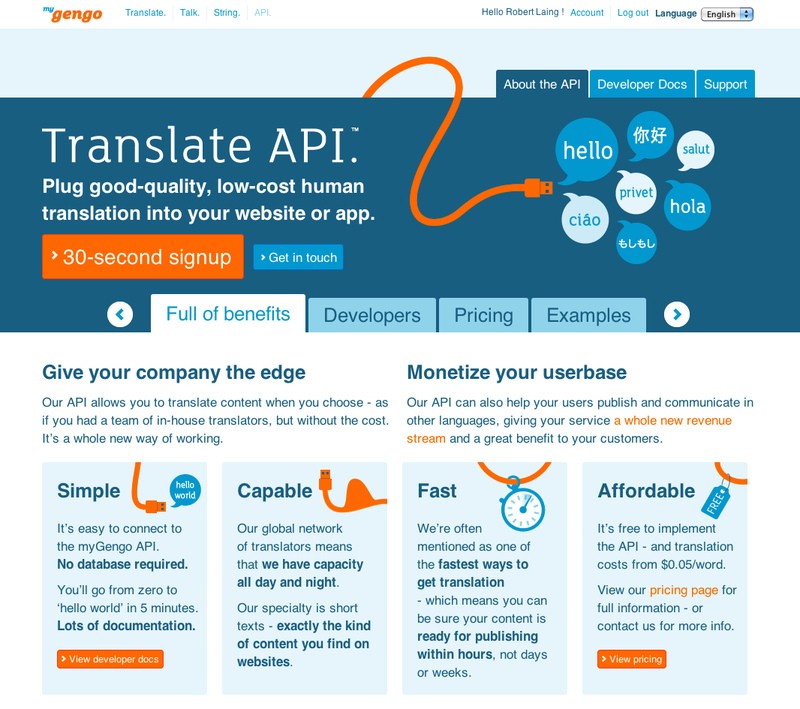 Using the API itself is free (as is opting for machine translation for selected pieces of content), while customers are charged the same prices for translation through the API as through the web form (starting from $ 0.05 per word). myGengo CEO Robert Laing says his company aims to have plug-ins available for the top 10 content management systems out by the end of the year and that its multi-lingual site tool “String” will be connected to the API next month.